When iOS 7 was released, Apple moved away from Skeuomorphism and towards minimalism. This was a welcome change at the time, which brought solutions to certain design crimes that prevailed and one very peculiar problem — Motion Sickness. There were a lot of reports and criticism because of a feature called Parallax, which among other things was a cause of concern for Apple at the time. Of course, this was fixed in iOS 7.1 by a simple accessibility setting which could be turned off. Parallax, when used right, could be key to offering a sense of depth while making sure the experience is unperturbed. Let’s check out how to craft delightful experiences using motion instead of headaches. The key is to keep is subtle. Also, incase you just want to see code, there's an Xcode project at the end of the post, feel free to download and check it out. The Boss Class behind the parallax sensation is UIMotionEffect. This is an abstract class, which means it cannot be instantiated directly, which means you have to subclass it. There’s a particular method keyPathsAndRelativeValues(forViewerOffset:) which needs to be implemented by all subclasses of UIMotionEffect in order for the system to be able to do what you want it to. This method basically returns a dictionary of view properties/keypaths which are animatable and values by which the property will be modified based on a parameter called viewerOffset. 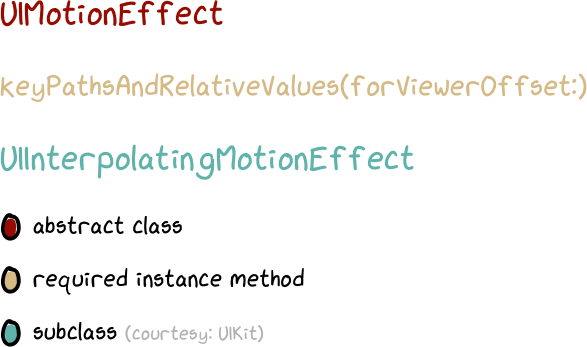 The parameter viewerOffset is of type UIOffset which is passed by the system to the method we have been talking about when there’s a subclass of UIMotionEffect present. 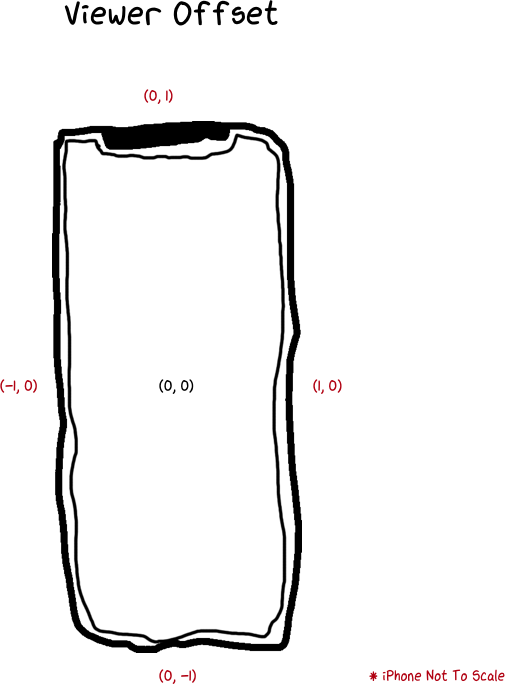 When the screen is directly pointed at the user, the viewerOffset value is at (0, 0). This property changes over the range based on how the user holds the device and it's tilt. Once you comprehend this bit, it’s just a matter of applying this concept to your views using the API, which in my opinion, is quite straightforward. Dealing with key paths and values for simple cases can be cumbersome. Looks like someone else also thought so at Apple because of which UIKit comes with a subclass of UIMotionEffect which already has this method implemented, which is UIInterpolatingMotionEffect. Let’s get into implementation details now. The parameters that we pass to the class are a keyPath of the view property that will be modified based on the motion along the axis that we specify in the type property. This denotes the extent to which modifications to a property can take place. The reason these properties are of type Any? because they can take values of CGFloat, or even a CATransform (by wrapping it in an NSValue object) which could give you more control over the kind of animation you could do based on the device's tilt. Finally, we add the object to our view using the addMotionEffect(effect:) method. Now that we know how to create simple parallax effects, we’ll see how to subclass UIInterpolatingMotionEffect by implementing a detail which tries to avoid giving people motion sickness, which kind of was the point of the article. This is a guide to help someone get started with UIMotionEffect covering just the basic cases of parallax motion, there’s a lot of potential to use this class in various ways to create interesting experiences and I encourage you to do it. Feel free to leave comments, also if you want other cases of the class to be covered do let me know, if there’s enough interest I’ll consider writing another post going through this in detail. Thanks to corsarus' article on the same subject which helped me understand how to override the dictionary returning method. Hello URLSession, My Old Friend.